This interview is taken from John Gill's book 'WILLY RUSSELL AND HIS PLAYS', and is used with John's kind permission. 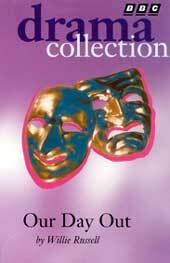 The following interview is taken from John Gill's book 'WILLY RUSSELL AND HIS PLAYS', and is used with John's kind permission. Shall we talk about 'Our Day Out'? That's play that was written very quickly based on your own experiences. Well, yes, it was. It took about four days to write it but I had taken a long time thinking about it. I'd tried a few times when I was still too close to teaching I think, to have that necessary objectivity. And then I was in London in an apartment which Robert Stigwood had hired for me and the family when I was writing the screenplay for 'John, Paul, George, Ringo … and Bert' and visiting us one night were Michael and Margaret and a couple of other people and Sheila and Jackie, two girls who were at St. Katherine's with me, who used to share the same dayroom with me and they'd been teaching for about 18 months and I hadn't seen them for about a year. I was then out of teaching. And during the course of the evening, I began to tell tales of the day I went on a school trip with Dorothy King, and I suddenly realised that I had liberated myself from the actuality of it and I was telling tales I could edit, amplify, and I knew then, that this could be a play one day. But even then, it was another six months before I actually tried it. I tried it a few times and got it wrong and I just hit the right tone this day, so I just stuck with it for four days and wrote it. So Bob went away that night and wrote 'Our Day Out.' And I'd throw in a couple of verses and then I said 'Briggsy should sing the instructions for how to enjoy a good day out.' Bob and Chris, I don't know which of them, wrote it and then I'd say 'Right there - Boss of the Bus - Right - Give me a solo moment.' So Bob went away and wrote 'The Boss of the Bus' in a matter of minutes, I then came back to rehearsals and it was amazing. I mean I had said to Bob, 'Right, here the feeling should be why can't it always be this way?' and lines like 'I would his collars really clean'. I remember sitting in my kitchen saying, 'That's the sort of thing'. Bob was amazing, he just took any lines that I was giving him and he married them into songs beautifully. I think looking at it the other night it could still stand the sort of job that I was talking about doing on it. (interviewed prior to the Belgrade Theatre Production in 1996) There are moments in which it is really musically weak and it could benefit from a really good look at but, the chances are that if you did that you could really damage the charm of it. It does have an innocent charm to it that reflects the way in which it was written. Anyway, what happened then was I came to rehearsals and there were hints of things that we put in that were not developed, so before it was published I did sit down with the script and I applied myself to the observations on the coach which crippled me the other night, had me in tears. I did it in a rather scatty travelling, rhyming structure and we'd had the boring girl just once, so I developed the boring girl all the way through. I tidied it up a bit. But it could still do with a look at, and it might be worth it one day. But then, you cut it off from the very people who I wanted to be able to play it: Youth Theatres, Schools Groups, Rep Companies. There is a terrible dearth of plays. 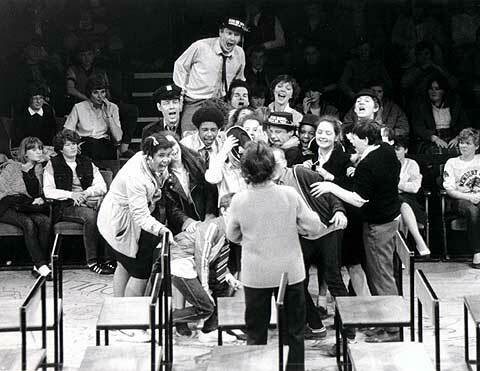 Youth Theatres have been into improvising for so long and what they've not done is throw up writers. Very sad that, I think. But what it does is it provides another play in that very thin list of plays that are do-able by large groups of youngsters. There's 'Zigger' Zagger' which now is dated I'm afraid, 'Oliver', 'Grease', ''Blood Brothers' - but it's not available any longer because of the West End - 'Our Day Out' and I'd start to flag now in the plays you can actually do that have meaning for the age of the kids that are playing them. I'm not talking about kids dressing up in Tudor frocks, but plays that have some meaning for them. Would you re-write the explicit political bit in 'Our Day Out' if you were writing the whole thing now? Would you make it less explicit? No. I think every word of it rings true but I think I would develop it more. I'd probably also find a way to dramatically weave it more into the fabric of the piece instead of stopping the play in order to have the platform confrontation.